When most people think of sportbike stunting, they conjure up the gearless tattooed jockey doing 80mph highway wheelies in traffic, running from the police or chasing down a Range Rover. There are (and probably will always be) the occasional idiots, but modern day stunters are parking-lot warriors who slay machines into submission and perform tricks that defy basic physics. Bruce Speedman and I have spent many hours in parking lots flirting with the balance point and a hospital visit—wheeling straight to the scene of the accident. But what happens to riders after they leave the stunting world? Most of them transfer their utilized skills onto other forms of riding. Case in point, Aaron Colton and Darius Khashabi, both insanely talented stunt riders also frequent the road racing and track day circuits with authority. Watching Aaron Colton go out and pass you at Willow Springs Raceway, then do circle wheelies in the pits on his Zuma scooter makes you feel somewhat less of a man. So what makes ex-stunters great riders? It's easy to crank your right hand back to engage light speed mode, but unless you only plan on riding in a straight line, throttle control is one of the hardest skills for a new rider to learn. While exiting a corner, a non-seasoned rider can easily make the mistake of grabbing too much throttle and discover what the term "high side" actually means. Stunting is a sport of finesse and elegance. You must be smooth in every aspect or you will be tossed off the bike. Stunter's learn quickly the art of throttle control in order to balance a wheelie or maintain a drift. From personal experience, I can tell you that maintaining perfect throttle control during circle wheelies is a god-like skill and insanely difficult to master. Excellent throttle control carries over into every discipline of motorcycle riding and unfortunately, traction control systems are removing the ability to learn this skill. I've watched some stunt riders and wondered if they were gymnast in their former lives. The balance stunt riders must have to keep a 400 pound motorcycle stable at 2mph on one wheel is incredible. Keep in mind that a lot of new riders drop their bike while on two wheels. Becoming a master of balance on your bike turns the hairiest of situations into simple tasks. Parking on hills, tight U-turns, slow traffic and more all require superb balancing skills. Stunt riders have the uncanny ability to predict machine behavior and proactively adjust their body position in order to keep the motorcycle upright. This intimate knowledge of two-wheeled physics gives ex-stunters the upper hand when it comes to maneuvering and manipulating the motorcycle during any type of riding from dirt, street, or track. The limits of traction can't be taught. They can be experienced as a street rider but it usually involves a crash or two. Stunt riding on the other hand encourages breaking traction purposefully in order to make the bike do something it was formerly unintended to do. Drifting a motorcycle is a perfect example of controlled traction loss, and by default makes the rider comfortable with the bike sliding around. Without stunting experience, becoming comfortable with the motorcycle sliding one or both wheels requires seat time during less than optimal riding conditions such as sandy roads, rain rides, or tar snakes. Those that are comfortable losing traction on a bike make for better riders overall and they also have greater riding abilities in dirt or track. We all know that hard braking is one of the best skills a street rider can have in their arsenal. 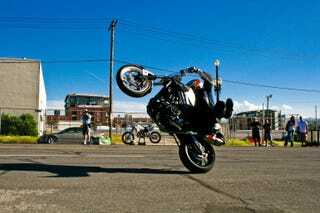 Stunt riders quickly acquire this talent through learning how to endo (stoppie) a motorcycle. Grabbing a brake lever at maximum pressure while going 60+mph in order to lift the rear wheel off the ground inherently teaches you a few things. The first being the limits of traction the front wheel can take under maximum braking, and the second being how the motorcycle reacts under rotor-warping braking forces. Ex-stunt riders are the guys who can out-brake everyone on the straight at the track day because they know how much force the bike can take before it gives. On the street, those hard braking skills translate into lifesaving emergency braking maneuvers to avoid those left turning minivans. Don't ask how I know this. Overall, ex-stunt riders make better riders because of their ability to control and understand a motorcycle. Continually pushing the bike beyond the limits can give you invaluable experience you will take with you for the rest of your riding career. Unfortunately, a lot of ex-stunt riders give up riding altogether due to the driving record infractions that tend to accompany the sport. The ones that make it out ahead and move on to other types of two-wheeled therapy are simply better at bike control than those who have never stunted. This post was written by Rick Botchner.